The establishment is now looking to finish off Donald Trump. The presumptive Republican nominee is under intense criticism for his comments about the federal judge presiding over the Trump University class-action lawsuit. Our political and media elites are trying to turn this into Trump’s version of Mitt Romney’s infamous “47 percent” comment — a watershed moment that cripples the GOP candidate’s electoral viability. Yet, this begs the question: What did Trump say that is so beyond the pale? Answer: nothing. This is political correctness gone mad — a desperate, pathetic attempt to distort and twist the Republican nominee’s words in order to portray him as a vile anti-Mexican bigot. That liberals are peddling this nonsense is understandable. This is what they do; lying about conservatives is their stock in trade. What is disgraceful, however, is that leading establishment Republicans are joining the lynch mob. The scandal began when Trump told CNN’s Jake Tapper that Judge Gonzalo Curiel might not be fair and objective because of his “Mexican heritage.” The context is everything. Prior to the interview, Judge Curiel had made numerous questionable and unethical decisions regarding the Trump University lawsuit. The suit was blatantly frivolous and should have been thrown out on several occasions. Judge Curiel refused to do so. In fact, he deliberately ruled that documents be released falsely alleging Trump was running a fraudulent operation. The goal was obvious: to humiliate and smear the Republican nominee. The judge’s defenders insist that he was born in Indiana, thereby making him an “American.” According to them, to even question the role played by his ethnic heritage is bigotry of the highest order. It’s “Un-American” shouted Paul Ryan. It isn’t — and Judge Curiel’s defenders are either willfully lying or ignorant. Either way, they should be ashamed of themselves. The fact is Judge Curiel is an anti-American, pro-Mexican radical leftist. His parents were immigrants from Mexico. More importantly, President Obama appointed him to the bench. The reason: Judge Curiel is a staunch supporter of open borders, amnesty and mass illegal immigration — especially, from Mexico. He is a seminal member of La Raza Lawyers, a militant pro-Hispanic legal organization devoted to promoting “the interests of the Latino communities throughout” California (the judge sits on a bench in San Diego). Judge Curiel is a pro-illegal immigration ideologue; he believes that U.S. immigration laws are fundamentally racist, oppressive and unjust. According to him (and La Raza Lawyers), American sovereignty and immigration statutes must be ignored and eventually eradicated. He has even participated in La Raza events where he granted scholarships to illegal aliens from Mexico — students, who could not speak a word of English. He is a rogue judge whose allegiance and political affiliation is not to America, but Mexico. He may be born in Indiana. His heart, however, is in Mexico City. It is not just his ethnic chauvinism and political activism that is deeply troubling. The San Diego law firm behind the Trump University suit also has extensive ties to La Raza Lawyers. Moreover, the firm is a major Hillary Clinton supporter. It paid $675,000 in speeches to Hillary. In other words, the class-action lawsuit is littered with conflicts of interest — the lawyers on behalf of the plaintiffs and the presiding judge belong to the same radical leftist, pro-Hispanic outfit; and the plaintiffs’ legal team and the presiding judge are partisan Democrats who share a common political interest in bringing down Trump. Any judge worth his salt would have recused himself. Judge Curiel hasn’t. The reason he won’t is the same reason that Trump is bravely and courageously insisting lies at the heart of the matter: Judge Curiel’s ethnic-based activism and radical political views precludes him from being fair, unbiased or professional. La Raza in Spanish literally means “the race.” Imagine if a white judge belonged to a legal association called, say, the White Order, which was dedicated entirely to advancing white racial interests and white nationalist causes. That judge would (rightly) be kicked off the bench immediately; the public uproar would be immense; the media and political establishment would be fuming. Yet, when it comes to Hispanics (and blacks) there is a blatant double standard: They can be racist; they can engage in identity politics; and they can see the world — including our legal system — through the distorted lens of race, ethnicity and blood. Whites, however, cannot. If this is not genuine anti-white racism, then I don’t know what is. Judge Curiel’s defenders, such as FOX News’ Megyn Kelly, insist that La Raza Lawyers is completely separate from the National Council of La Raza. It’s a distinction without a difference. They are sister organizations. They share the same militant pro-Hispanic left-wing agenda. They both receive much of their funding from open-borders advocates like George Soros. They both are mouthpieces on behalf of the Mexican government. They both champion uncontrolled legal and illegal immigration. And both assert that their Hispanic identity comes before their loyalty to America. In short, they are Latinos first and Americans — if that — second. 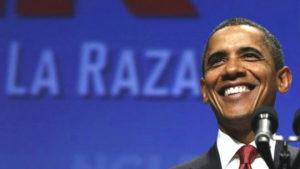 The National Council of La Raza is a fifth column. Many of its members call for the “Reconquista” — the re-conquest of the American Southwest by Mexico. They believe — and this is taught in many Mexican schools and espoused in numerous Mexican newspapers — that the United States stole California, Texas, New Mexico, Nevada and Arizona during the War of 1848. They seek to erect a “Greater Mexico” not by military aggression, but through mass immigration and cultural annexation. This is why they aggressively push for sanctuary cities, open borders, bilingualism, unlimited influx of illegal aliens and Hispanic separatism and Latino racial solidarity. Their goal is to forge a distinct Mexican/Hispanic nation within America. It is treason in the form of Balkanization. This is why La Raza members have been behind many of the violent anti-Trump riots. Take the recent one in San Jose. It’s no accident that Trump supporters were beaten, punched and assaulted, while pro-illegal immigrant rioters burned the American flag and waved the Mexican flag. The logic of Hispanic racial and cultural separatism is clear: Those rampaging thugs may live in America, but they belong to a pan-Mexican homeland. Trump poses a mortal threat to this revanchist project. His America First agenda — the desire to build a wall along the southern border, enforce our immigration laws, deport criminal illegal aliens, restore America’s sovereignty, renegotiate disastrous trade deals such as NAFTA and end the loss of millions of manufacturing jobs — stands against the globalists and corporate interests that have hijacked both political parties. He is the only major leader willing to oppose the gradual dissolution and betrayal of our country. Gonzalo Curiel has no business being a federal judge. Any man who belongs to an organization that is defined by and devoted to advancing the interests of a particular ethnic, national group at the expense of others is a narrow-minded bigot. Trump is completely correct: He is the victim of a political witch-hunt by a militant La Raza leftist whose ultimate allegiance is to Mexico — and not America. The political and media establishment could not defeat Trump during the primary. They are now hoping to crush him before the general election. They have only one strategy left: Smear him as a racist demagogue. This libel is not only false; it must be exposed for the cheap, craven propaganda that it is. They are spinning lies in service to their globalist, corporatist masters. In short, they are traitors, who are willing to sell our country down the river. It’s no wonder they are circling the wagons for Judge Curiel. He’s one of their own — an anti-American zealot who cares nothing for our borders, our culture and our Constitution. Our transnational elites may adore Judge Curiel. I, however, stand with Trump. With whom do you stand?